Standing on the vantage point of the Silver Jubilee National Conference of the Indian Association for Social Psychiatry, what have we learned, achieved, accomplished? We held a large number of conferences, have made a number of collaborations. However, most importantly, we have survived! This is, to my mind, no mean task, given the unrelenting ascendancy of biological psychiatry. Social psychiatry must be seen in a global context and in the backdrop of major threats to our civilization. Any discerning person, who himself has survived five decades of psychiatry, would vouch for the bare fact that “no psychiatry is complete without social psychiatry.” Indeed, I would even go as far as to assert that “social psychiatry is core psychiatry.” The few issues that I have highlighted in this perspective – and I am sure there are many more – simply go to show that, in this era of living in a global village, social psychiatry will continue to live forever! Social psychiatry remains an integral and essential component of core psychiatry. The author, who was an earlier president of the Indian Association for Social Psychiatry, and now the president of World Association of Social Psychiatry, discusses some of the key influences in his career developmental trajectory which oriented him to the necessity of the social component of psychiatry in patient care and organizational work. It is expected that these lessons, shared with the readers, will motivate others too in the area of social psychiatry. We are privileged to have this opportunity to organize the landmark Silver Jubilee National Conference of Indian Association for Social Psychiatry at the birthplace of family-based psychiatry in India. On behalf of the Organizing Committee, it is our pleasure to invite you to join us for the Silver Jubilee National Conference of the Indian Association for Social Psychiatry (November 16–18, 2018). The theme of the conference is “Prioritizing Rural and Community Psychiatry in India,” which is in line with the core objectives of Indian Association for Social Psychiatry and is important from clinical and public health perspective. There are many challenges to delivery of mental health services in rural areas with concerns about their availability, accessibility, and acceptability. This conference will hope to find some directions and strategies to resolve these challenges. The Indian Association for Social Psychiatry (IASP) celebrates its Silver Jubilee National Conference this year in the state of Haryana, on the theme of “Prioritizing Rural and Community Health Care in India.” It is a time to rejoice and also an opportunity to reflect on the objectives with which the society was founded. It is important to reflect if we have achieved our aims and where and how we need to direct our efforts for this society to make noticeable change in the way mental health services are planned and delivered to the vast majority of Indian public deprived of this essential component of total health. Currently, a large section of our population, predominantly rural, is served through the implementation of the District Mental Health Programme (DMHP). It is an offshoot of the National Mental Health Programme, a revolutionary idea in the 1980s. However, since then, the health systems have undergone tremendous changes. We are stuck with the old delivery methods. It is time the mental health too adopts new digital technologies to reach its unreached population. IASP can and must take lead in making collaborations with all the stakeholders and partners and use modern health systems to achieve its aims and objectives. After all, the nation's prosperity depends on mental well-being of its citizens. 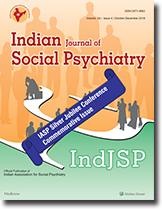 As psychiatry made a steady progress in India, organizations such as the Indian Psychiatric Society and Indian Association for Social Psychiatry (IASP) also grew in strength. These organizations played a crucial role in facilitating research and promoting academic interest in the field of mental health in India. It was felt that there is a great need to have a look into the sociocultural factors and their role in the phenomenology, course, and outcome in mental health problems, especially in the Indian context, with its rich and diverse sociocultural milieu. It was also well acknowledged that the treatment of mental disorders involved a multidisciplinary approach and nonpharmacological management was at least as important as medications. These factors fostered the birth of IASP (in January 1984), which was a distinct organization with different mental health professionals (psychiatrists, psychologists, psychiatric social workers, and psychiatric nurses) that sought to focus on social issues in psychiatry. Over a period IASP was able to create a niche for itself not only in India but globally as well; hosting of World Congress of Social Psychiatry, the prestigious academic event of World Association of Social Psychiatry in 2016 further strengthened IASP's position in the international forum. Nevertheless, IASP did have to struggle from time to time and circumvent around challenging issues. This narrative gives a bird's eye view (as seen by BS Chavan, former Secretary General of IASP) of how IASP evolved over time and how it traversed hurdles to become what it is today. In this article, Prof. Dr. Vinod Kumar Sinha reflects on his 8 years as the immediate past Editor of the Indian Journal of Social Psychiatry (IndJSP). He first introduces the reader to the uniqueness of the journal. Its academic values are thereafter reviewed. Furthermore, Dr. Sinha contemplates on the clinical importance of the articles included in the IndJSP. He then shares his views on the direction in which the IndJSP should proceed. He concludes by emphasizing the need for more research among children/adolescents and the elderly in India. Rural and community psychiatry has a special relevance to India because of the distribution of the population, limited professional resources, and the challenges of the multicultural societies in the country. Professionals and planners have pioneered initiatives to integrate mental health care with general health care, strengthen families' role in mental health care, and built up wide range of community care programs to “reach the unreached.” The progress has been impressive but much needs to be done. There is greater need to think of fully utilizing the potentials of “people” as the ultimate resource for rural and community psychiatry. With a huge population of 1.3 billion and deficient mental health personnel and infrastructure, India needs newer strategies for rural and community mental health care. There is a huge and unmet gap in mental health services, which needs our immediate attention. The National Mental Health Program and District Mental Health Program have made very welcome beginnings, but they are a long way off from even remotely reaching an optimal coverage. Nongovernmental organizations have been playing their important part as well. However, an important impetus can potentially come from the new mental health policies and legislation, which are in keeping with the United Nations Convention on Rights of Persons with Disabilities. Still, there is a lot to be done. The rural mental health services are often neglected and need immediate attention considering the burden of disease and treatment gap. Identifying the economic, social, and political barriers to the utilization of existing services would strengthen the delivery and utilization of these services. The mental health professional should be at the helm of leading and heralding the changes needed. This provides us with the challenge, as well as an opportunity. Community mental health care in India started in the 1970s. It was long felt that integrating mental health with primary care by training and supporting primary health care personnel to deliver basic mental health care was the best way to provide care for those in need of mental health services in the developing countries. This has been recently echoed by an international consortium as well. The national mental health program, and later the district mental health program, has been right and ambitious steps in this direction. However, effective coverage for severe mental disorders and epilepsy continues to be very low. While there are vast variations across regions of the country, the highest treatment gaps are in rural areas because of inequities in the distribution of mental health resources and variable implementation of mental health program across states. We now know what to do, but we have to begin doing it effectively. It is indeed high time that we prioritize rural and community mental health in India. Fueled by the discovery of effective medications and the debilitative effects of psychiatric institutionalization and driven by the social winds of change, community psychiatry took shape all over the world. The gradual closure of asylums and the move to community signified not only a geographical shift, but also led to the development of a whole new raft of practices in delivering services in the community. Many of these have become mainstream practices elsewhere. After a promising start, initiatives in community psychiatry have stalled in India, with the lack of resources being the most obvious cause. For various reasons, the field of social psychiatry has also not been in the limelight as psychiatry shifted its focus to the possibilities held out by biological psychiatry. This is unfortunate because the need for broader models is never more relevant than now, as social inequities continue to grow. Therefore, the time is ripe to look back over the developments in community psychiatry of the last quarter century and search for relevance in the light of our current realities. What are the main developments and more importantly, can these be implemented in a cost-effective manner in India? This article is a reflective attempt to argue for the feasibility of models using those principles but adapted for our social and economic realities. This article adopts a multidisciplinary approach to community integration (CI). We concentrate on CI programs for sexual minorities. Stakeholders are those nonheterosexual individuals who experience psychological distress when confronted by social prejudice and nonacceptance. The majority of Indian citizens identify as heterosexuals. We argue however that sexual orientation is only one form of selfhood and that people have multiple identities, with multiple belongings. CI programs we propose should make use of such diversity in Indian society and aim at strategic partnerships between Indian citizens with hetero and nonheterosexual orientations. The integrated and intersectional approach we put forward aims at social empowerment of stakeholders. Industrialization, urbanization, modernization, and globalization have contributed to significant changes in the culture of the world, more in the non-Western third world since the end of the colonial period, and the Second World War, contributing to some progressive, undesired changes. Some of the major changes include weakening of extended family, nuclearization of family, two parents working family, changing roles of women and men, increased immigration, Westernization of arts, music, day-to-day living, changing child-rearing practices, globalization of language, and influence of multimedia. As a result of many of these changes, social psychology, family psychology, and family relationships drastically transformed the family and individual psychology. Before these mega changes, family and individual psychology were shaped by extended family, traditional Indian value system, and child-rearing practices. With the radical changes in the socioeconomic structures, the traditional “we self and familial self” is evolving into more a Western “I self,” and a “multinational/global self”. Women are enjoying an increased sense of independent self and work-related self esteem. Traditional Indian developmental stages may be yielding to more Western individualistic social structures. In additon, we are too forced give up some of the traditional, cherished values and relational patterns. Reshaping the development of a new self (bicultural and multicultural self), a new sense of autonomy, and newer sense of individuation. All these, in turn, are contributing to development of an evolving new culture, with hope of preparing us better for a new, better world. Sociality in primates is determined by the social brain and is the outcome of an intricate and multi-dimensional relationship between the brain size, the richness as well as the selectivity of the neural networks and the behavioral complexities emanating from the bonded relationships that underpin the social coalitions. Accumulating data from the neuroimaging and cognitive neuroscience research reveal that the more intricate and extensive are these neural networks, the more powerful is the social experiences. Yoga and meditation practices are ancient and relatively inexpensive yet quite rich experiences with far-reaching health benefits. Their powerful effects are beginning to be understood in terms of their effects on neuroplasticity which is now known to occur in a wide variety of neural circuits with many different simultaneous mechanisms that involves the immensely active neurodynamic model of human brain which has by and large replaced the old static model and has been the major focus of recent research. In the last two decades or so, the major scientific advances have shown positive effects of Yoga and meditation on physical and emotional health including not only functional changes in brain hemodynamic or metabolism, etc. but also, permanent changes in brain structures as well. Embarking upon the psychobiological aspects of the social brain, of the group mind and that of Yoga and meditation, in this chapter we provide a synthesis of their psychobiological concomitants as well as socioclinical implications, both potential and factual, from a diverse array of subspecialties, for example, positive psychology, spirituality, neuroimaging and neurophysiology, cognitive neuroscience, and neuroimmunoendocrinology, etc. The purpose of doing so is to provide a synthesis for ensuing richer and multidisciplinary collaborations to understand this fascinating topic which may eventually lead to integrated management of the various maladies of the social brain deficits. Disasters and their impact and mitigation best illustrates the value of social psychiatry. Social psychiatry “recognises the importance of social institutions like family, community, and for social cohesion beyond the individual level characteristics and actions for mental health.” The emotional health of populations exposed to disasters is a well-recognized public health priority. Toward mitigation of the negative impact of the disasters on mental health, and building resilience is vital. The recent flood disaster in the southern state of Kerala illustrates many of the areas where Indian Social Psychiatry can, and should, rise to the challenges of mitigating human suffering and protecting the mental health of disaster-affected people. Rebuilding of Kerala, especially in relation to mental health, requires building emotional health of survivors through self-care; strengthening of families; supporting Anganwadis, schools, colleges, and workplaces to become places to promote mental health; creating caring communities from Panchayat level; building resilience at the community level for long-term preparedness; and most importantly, to sensitize the administrative mechanisms for the mental health aspects of developmental choices and disaster preparedness. The Aboriginal and Torres Strait Islanders (ATSI) are the Indigenous people of Australia and constitute 3.3% of the Australian population, having been present in the country for more than 50,000 years before the colonization of Australia in 1788. Aboriginal culture/society is structured around the community, with strong kinship, belief systems, family ties, and networks. The colonization of Australia led to significant adversities for the ATSI population with loss of traditional way of life, land, and resources; marginalization, poverty, and being subject to racism and policies such as the “stolen generations” causing intergenerational trauma. These factors are considered as substrates for the subsequent increase in mental health and other health issues. ATSI people have poorer outcomes compared to other Australians in areas of physical health and life expectancy. They have higher rates of mental illness, suicide, alcohol/substance misuse, incarceration, and being subject to violence. Epidemiological research is lacking in ATSI population because of methodological difficulties. There are government policies/initiatives to reduce the disparity, which has been slow to bear results. The concepts of cultural safety and competence are important in the clinical management of ATSI population. Clinical presentation/management can be different in this group, and there is a need for more clinical guidelines. There have been a number of innovative strategies to improve mental illness outcomes. The paper illustrates the psychosocial impact of colonization on the ATSI population. There is an urgent need for research to understand and address the core issues that drive health inequalities in this group of disadvantaged Australians. Advances in modern medicine are making the vision of personalised medicine within reach. Psychiatry is the leader in the practice of psychobiosocial medicine and should be leading the charge for delivering person-centred care. Engaging patients as equal partners in clinical decision making is compelling ethically but also makes clinical and financial sense. It is vital that psychiatric service and training organisations enable clinicians to become leaders in the delivery of person-centred care.